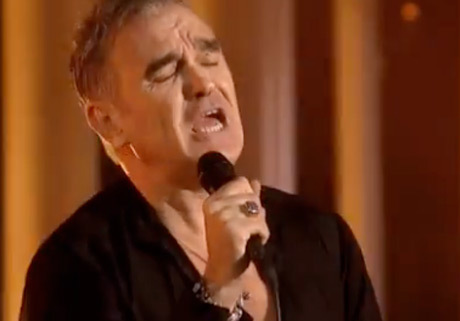 As promised, Morrissey played the Nobel Peace Prize Concert tonight (December 11), and already we have footage of Moz's triple-threat performance. For his set, Morrissey delivered "People Are the Same Everywhere", his cover of Lou Reed's "Satellite of Love" and "Irish Blood, English Heart," from 2004's You Are the Quarry. You can watch it all below. For whatever reason, the backing band all work blue "Hustler" T-shirts and Moz rocked what look to be his comfiest of inside pants.